Executive Chef John-Vincent Troiano’s culinary vision encompasses his rich culinary background, where he has immersed himself in various restaurants across the globe to perfect his technique. The beginning of his journey was cooking alongside Japanese master chef Masaki Hashimoto. There is no doubt that the beautifully presented multi-course “Kaiseki” and the intricate flavours prepared with Japanese techniques at Frilu remain central to his culinary art. Ontop of Asian influences, the dishes also reflect a marriage of Tuscan, Nordic, Italian, and Canadian flavours, which embodies not only Troiano’s roots, but also his culinary experiences (such as his work at 3-Michelin Star restaurant Benu). Head chef, So Sakata, and Keith Siu are also behind the team in curating the Canadian-contemporary-meets-Asian-techniques dishes. The innovative touches revolve around the autumn season, serving a variety of locally-hunted meats (like deer, trout, and duck), in-season ingredients (like pumpkin, onions, and jerusalem artichokes), intricate cooking techniques (like Japanese charcoal “binchotan”), and special nature-esque aesthetics (like “leaf-shaped” crisps and broth “waterfalls”). Lar-eo is a savoury take on an oreo. Pork fat “lardo” is rendered and toasted in nutty spices and is sandwiched between a wholesome blend of blueberry flour and black quinoa. 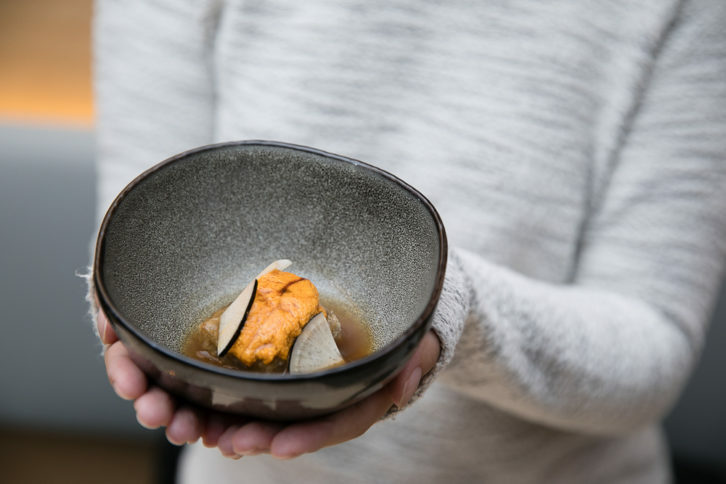 Great Lake and Trout unifies Japanese and Italian flavours by curing Ontario rainbow trout with seaweed and prosciutto and immersing it in a brown cherry and sake broth, then complemented with yeast oil. Ground and Sea uses the agedashi technique on burdock instead of tofu. Its slight crispness is contemplated with creamy Vancouver sea urchin, radish, and thickened chicken jus. Cervos, Smoke, and Hazel highlights Chef Troiano’s hunted-venison-tongue which is placed in a sous-vide with coffee, bayleaf, and juniper notes, then hand-roasted. Toasted hazelnut crumble and caramelized onion and anchovy puree add a flavourful finish. Pumpkin Patch is a a memorable dish that epitomizes the fall season in not only its presentation but also its taste. 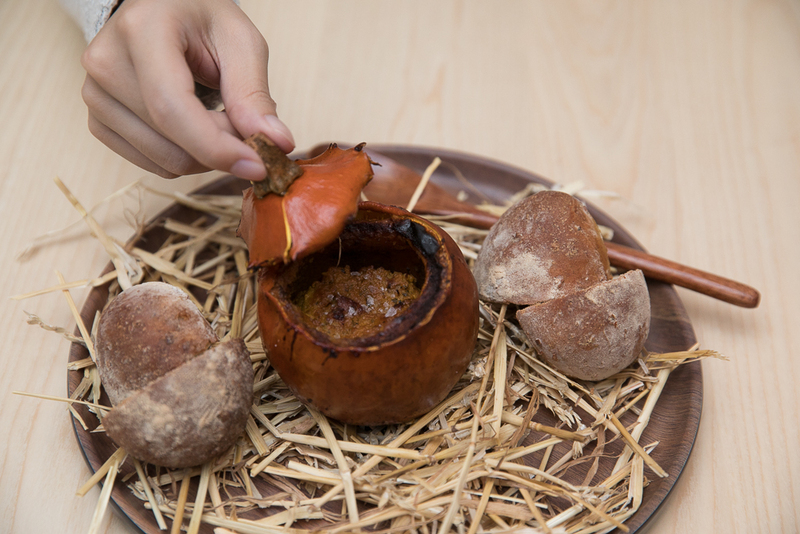 A young pumpkin shell is stuffed with marrow souffle and lined with cinnamon and nutmeg. Sourdough pumpkin seed bread is freshly baked in-house to complement the spread. Mineral/Savoury is a phenomenal dish that is self-explanatory to its flavours. Hen of the woods mushroom is grilled over binchotan, and dipped in fermented mushroom paste, mushroom jus, and home-made bread miso. Surf and Turf harmonizes a soothing brown-buttered lobster with a sharper horseradish puree. In addition, beef floss, a salute to a traditional Chinese topping, and crab oil is added. Waterfowl: Marsh also showcases Chef Troiano’s hunting skills. The presentation reminds me of a terrarium, where dry-aged duck breast is nestled in a greenery of nori, bonito flakes, dehydrated kale, turnip, and apple. The waterfowl is a delicious burnt onion broth which brings together all the flavours. Earth Apple contrasts textures smooth and crisp textures with a beautifully executed dessert. Jerusalem artichoke icecream sits on a bed of coffee crumble, alongside dollops of apple purée. The top is accessorized with dehydrated Jerusalem artichoke “leaves” brushed with simple syrup. Dora Cake transforms the traditional dorayaki cake using mascarpone, fermented pear, and sake paste as the filling sandwiched between two castella pancakes. All-in-all, the combination of both casual and upscale ingredients with delicate preparation mirror the enchanting experience at Frilu.